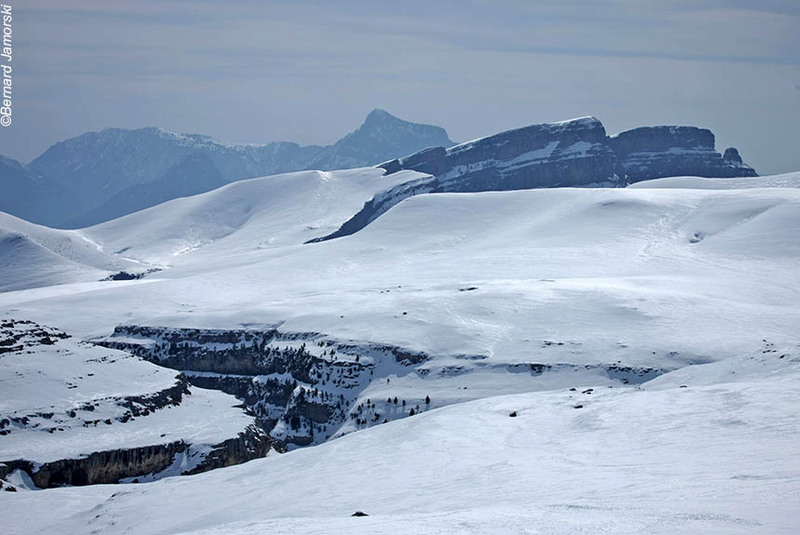 Spain's Ordesa National Park has it all: magnificent mountains, beautiful villages, dramatic valleys, glorious forests, and wonderful winter walking around it all. If you have never been, go! 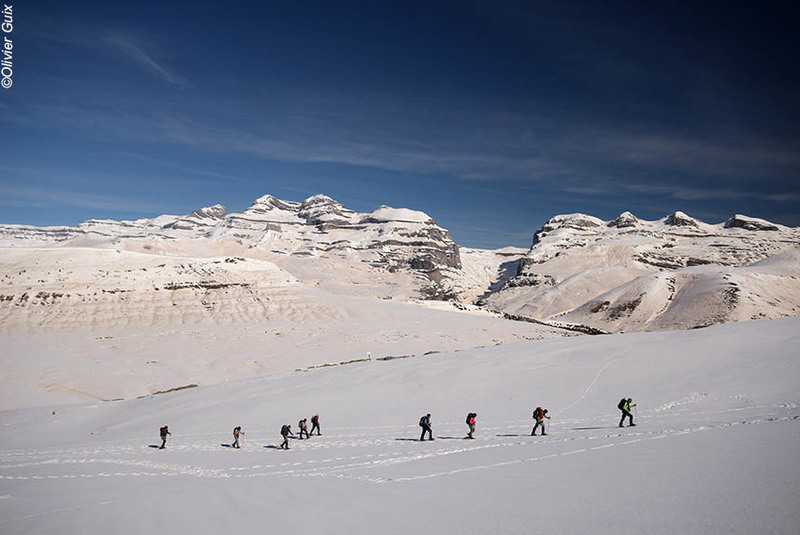 You may never have heard of the extraordinary Ordesa National Park, the traditional mountain village of Torla, or the Lost Mountain (Monte Perdido in Spanish, Mont Perdu in French) and all the dramatic mountains in the region, but we can assure you that they are very well worth considering if you want a truly memorable winter walking holiday on the Spanish side of the Pyrenees. Please note: you can take the London-Lourdes Saturday flight to begin this holiday, but you won't be back in Lourdes in time to catch the flight back, but there are daily flights from Toulouse (direct train from Lourdes). Saturdays: we meet you at Lourdes airport to take you to our hotel in Lourdes for this first night, or if you arrive by train (fast services), you can simply walk the 50 metres to the hotel. You are then free to explore the historic city of Lourdes. If you arrive at Toulouse, then you can choose to arrive in Lourdes on Saturday, or by early Sunday afternoon (with the price lowered accordingly). Until early Sunday afternoon, you are free to explore the city, or walk in the surrounding hills (we supply detailed route instructions, and usually they are snow-free). You then meet together with your English speaking guide and the other group members (minimum 5; maximum 15) for the transfer via the scenic Ossau and Aspe valleys, and "over the top" into the époustouflant (a much better word for breathtaking!) Ordesa National Park, and your hotel for the next 6 nights. A truly memorable journey in itself, we think you'll find. This afternoon, or tomorrow morning, your expert winter walking guide will give you a snow-shoe winter walking lesson (as required). In truth - and unlike both downhill and cross-country skiing - it requires minimum equipment, little tutoring, negligible stress, and is easily picked up by simply doing it! Perhaps surprisingly, though, you'll find it is far less physically demanding than any form of skiing. You stay in the upper Ara valley near the mountain village of Fiscal in a completely but sensitively restored 18th century stone built hotel called Casa Cadena. It is an authentic mountain hotel that provides all hospitality and bedroom comforts you would expect as well as an attractive lounge and bar, and a good local reputation for its regional cuisine that almost exclusivley uses locally sourced produce. As you can imagine, we know dozens of hotels in this region, and this is our favourite. That's why you are staying here! We drive you to the heart of the Ordesa National Park, and the remarkable Arrazas canyon, which rises gently through lovely beech woods beneath the impressive (to say the least) cliffs and peaks of the Fraucata mountain range. In total, the ascent today is only 650 feet, but all the same you will be very well rewarded when you arrive at today's destination, the magnificent Estrecho waterfalls. They are tumultuous in summer, terrifying in spring, but a wonderful natural sculptural spectacle in winter. There is a great sense of satisfaction reaching such a natural wonder in the middle of winter - especially as so few do so because this, like many other places you will be visiting, could not be visited without an experienced guide. A great start to a superb week of winter walking that today culminates in time to explore the attractive and traditional village of Torla. Today you are taken through wonderfully scenic landscapes to the mountain village of Bielsa, which is the gateway to the immense Pineta canyon. Then you are driven several kilometres up the canyon before beginning your winter walk through pine forests up to the almost 5,000 feet Larri plateau where there is an indisputably isolated mountain refuge. All around are stunning panoramic views dominated by the Lost Mountain itself: Mont Perdu in French, Monte Perdido in Spanish. At almost 11,000 feet, it is more than twice as high as the plateau you had believed was pretty high up! What makes it all the more visually dramatic is that from the summit there are 6,500 feet (yes, 6,500 feet!) of sheer cliffs that descend to form the magnificent Cirque de Pineta. You will enjoy the privilege of walking through the Cirque before arriving back at your vehicle, which will stop to give you time to wonder round the pretty village of Ainsa with its grand Plaza Mayor. A memorable day for sure. We take you through wonderful landscapes up to the impressive perched hamlet of Nerin then up the unforgettable Anisclo canyon using an ancient drovers' track up to Cuello Arenas. 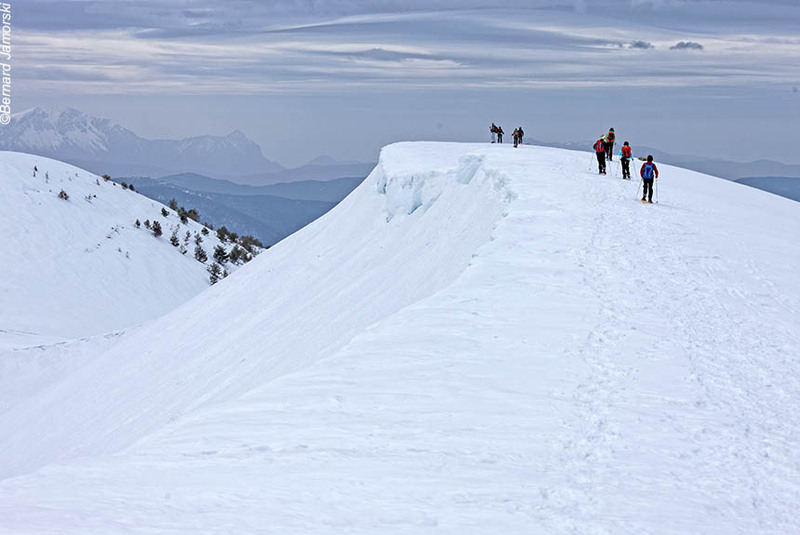 From here it's an easy high altitude walk with superb views all around to Cuello Gordo, a panoramic viewpoint for Mont-Perdu, the "Cylinder", and other peaks all reaching towards 10,000 feet. Our French colleagues call it "un spectacle grandiose", and that's pretty accurate! You return down the Pardina canyon via 4x4. As you can appreciate, this itinerary is dependent on snow conditions, but is usually possible, and there are nearby alternatives. 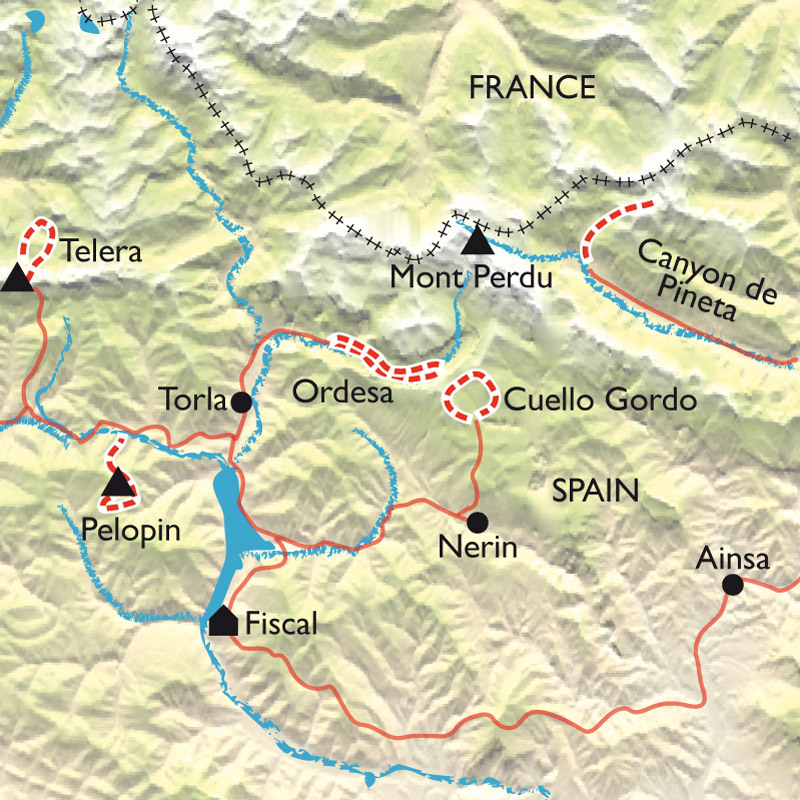 It takes a lot to get us out of the Ordesa National park, but today we do so for the magnificent "Pyrenean Dolomites". The 9,000 foot mountain range features a series of sharp (soemm say teeth like) peaks dominated by the highest one, Peña Telera - a mountaineers' favourite. Yet what makes them all the more impressive - and we have to say beautiful - is that the made-for-snow-shoeing Tena valley runs for miles beneath it providing endless, but constantly changing, views to complement the satisfying winter walking. It's a wide, usually sunny valley with stream,waterfalls, a lovely lake, and deserted tracks that enable you to have a total ascent/descent of only 800 feet in the 3 or 4 hours walking you will enjoy here. And we think enjoy is the operative word. Please tell us if we were right to take you away from Ordesa. Why take you out of the Park for this last day? We have a completely 360° top-of-the-world answer that begins in Linas de Broto where every house is stone built, and the church 13th century. 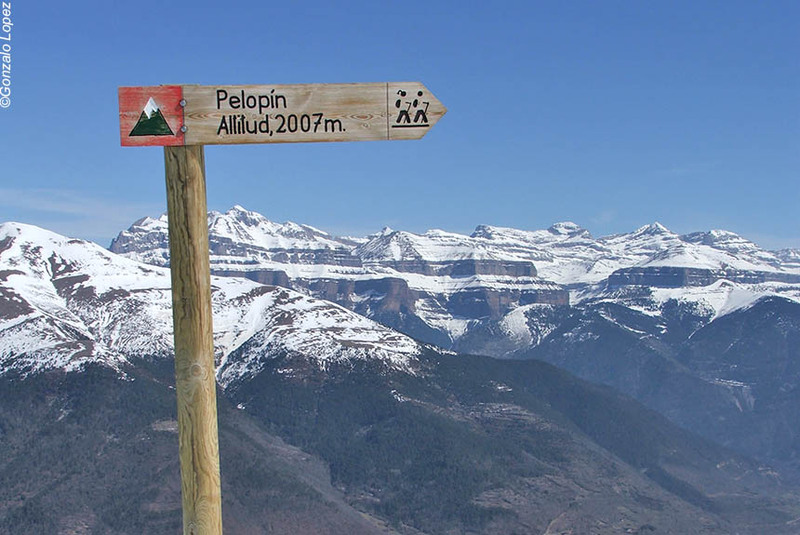 Our destination is the 6,500 feet Pic de Pelopìn, and yes you are walking to the top, but your total ascent/descent is actually less than 2,000 feet. Why so special? It's that 360° view that features Mont Perdu itself with its surrounding massif, and the famous Brèche de Roland - the 300 feet high "slash" reputedly taken out of the cliffs that mark the Franco-Spanish frontier by Count Roland's sword after being defeated at the Battle of Roncesvalles in 778. Then there's the Pic de la Tendenera (a knife edge summit with absolutely sheer cliffs dropping thousands of feet), the glorious Aragonese Sierra, and the 10,700 feet Vignemale (Comachibosa in Aragonese) with a huge glacier beneath it. The most challenging walk of the week, but we're sure you will agree it was more than worth it. After breakfast, it's a 3 hour transfer back to Lourdes station, but, as we say elsewhere, it is not possible to catch the London flight. There are direct trains to Toulouse and Bordeaux, which have direct flights to London and other British cities. This holiday for English speakers has a fluent English speaking guide as well as being for French speakers. It starts on Saturdays to coincide with the weekly flight from London Stansted to Lourdes - by far the lowest cost, fastest and most direct journey from the UK. Sunday meeting point: whichever way you travel or day you arrive, the meeting point is early afternoon in front of Lourdes railway station where you will meet your guide, and be taken to the holiday hotel. After breakfast, we take you back to Lourdes by 13h. It is not possible to get to Tarbes-Lourdes airport to catch the London flight as this would require the group to leave well before breakfast, and there may be delays due to weather and/or road conditions. There are direct trains to Toulouse and Bordeaux from Lourdes station. 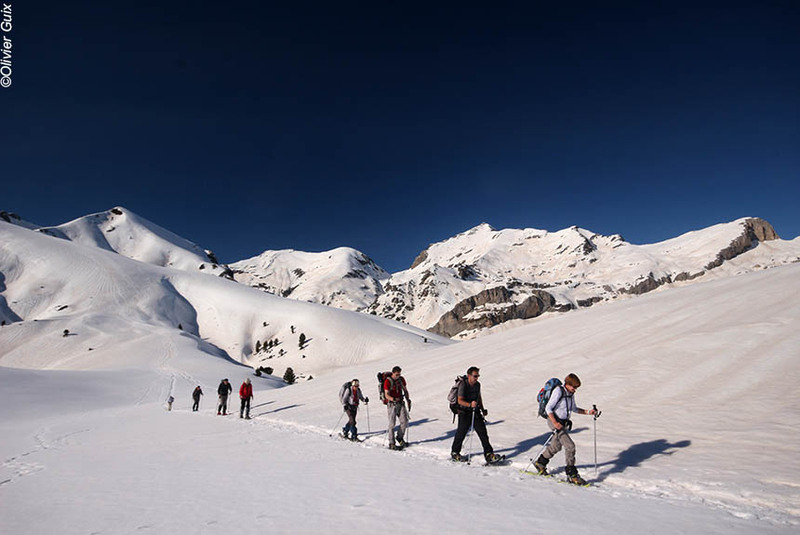 Each day the time spent on your snow-shoe walking journey will vary between 2 and 5 hours including rests etc. The total daily ascent/descent will range from 200 to 650 metres (600 to 2,000 feet). This is less than a summer walking holiday, and is intended to be comfortable for anyone who can walk for 4 or 5 hours in hills and valleys. On some days, there are shorter and longer options, but this is a marginally more challenging holiday than some others mainly because of the last day. We have found that our customers really enjoy being in a small group that includes both English and French speakers. The minimum group size is 5, and the maximum is 15. There is no minimum/maximum for English speakers. The guide will speak at least good conversational English, and usually speak fluent English, or be bi-lingual. He or she will also be a qualified and expert winter walking guide. The accommodation consists of: one night in a 3 star hotel in Lourdes; 6 nights in the authentic hotel in the Ara valley. Meals: continental style breakfast at the Lourdes hotel, and each morning thereafter. The restaurant offers a menu of local and regional specialities for you to choose from. Hotel supplied picnics for each day, except day 1 and day 2 are also included. Wine and other drinks are not included in the holiday price.